Enjoy hours of spooky fashion fun with Frankie Stein from Monster High. 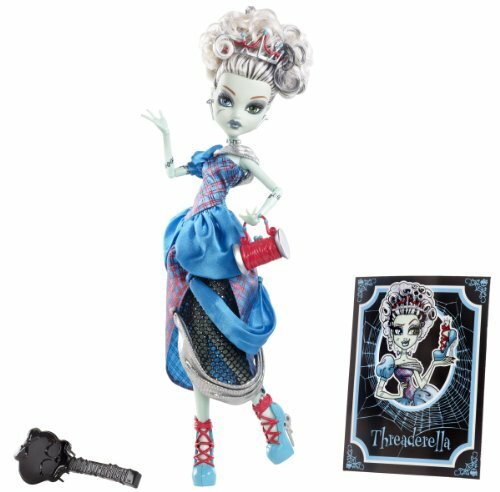 Frankie is dressed in a spooky costume and comes with a purse that resembles a spool of thread, as well as with shoes with scissors as heels to resemble the beloved character Threadarella. Frankie wears a tiara made of needles and thread to complete her spooky look. The Monster High original ghouls wear their freaky flaws with pride! Their sleek fashions are perfect for a day inside the iconic walls of Monster High -- or an adventure in the monster universe outside. Articulation at the shoulders and knees adds to the fun with more scary cool poses and storytelling possibilities. Each doll’s fashion is inspired by her fierce personal style and unique scaritage. Gigi Grant doll, daughter of a Genie, looks boo-tiful in a cut-out dress with color-blocked print and gorgeous accessory. Look for monsterrific touches, like her colorful hair, that showcase her freaky fabulous flaws. Ghouls at home will love learning to embrace what makes them unique along with their beast friends from Monster High. Collect them all (each sold separately, subject to availability). Includes articulated Gigi Grant doll wearing fashion and accessories. Doll cannot stand alone. Colors and decorations may vary. The Monster High original ghouls wear their freaky flaws with pride! Their sleek fashions are perfect for a day inside the iconic walls of Monster High -- or an adventure in the monster universe outside. Articulation at the shoulders and knees adds to the fun with more scary cool poses and storytelling possibilities. Each doll’s fashion is inspired by her fierce personal style and unique scaritage. Frankie Stein doll, daughter of Frankenstein, looks electrifying in her signature plaid print with mesh bodice. Voltageous heels and matching jewelry complete the to-die-for outfit. Look for monsterrific touches, like her black and white streaked hair and body stitches, that showcase her freaky fabulous flaws. Ghouls at home will love learning to embrace what makes them unique along with their beast friends from Monster High. Collect them all (each sold separately, subject to availability). Includes articulated Frankie Stein doll wearing fashion and accessories. Doll cannot stand alone. Colors and decorations may vary. The Monster High original ghouls wear their freaky flaws with pride! Their sleek fashions are perfect for a day inside the iconic walls of Monster High -- or an adventure in the monster universe outside. Articulation at the shoulders and knees adds to the fun with more scary cool poses and storytelling possibilities. Each doll’s fashion is inspired by her fierce personal style and unique scaritage. Frankie Stein doll, daughter of Frankenstein, looks electrifying in a Skullette and bolts-themed print with sheer black shoulder and black belt detail. Voltageous booties and matching jewelry complete the to-die-for outfit. Look for monsterrific touches, like her black, silvery and white streaked hair and body stitches, that showcase her freaky fabulous flaws. Ghouls at home will love learning to embrace what makes them unique along with their beast friends from Monster High. Collect them all (each sold separately, subject to availability). Includes articulated Frankie Stein doll wearing fashion and accessories. Doll cannot stand alone. Colors and decorations may vary. The Monster High original ghouls wear their freaky flaws with pride! Their sleek fashions are perfect for a day inside the iconic walls of Monster High -- or an adventure in the monster universe outside. Articulation at the shoulders and knees adds to the fun with more scary cool poses and storytelling possibilities. Each doll's fashion is inspired by her fierce personal style and unique scaritage. Draculaura doll, daughter of Dracula, looks fangtastic in her favorite pink and black with a heart print and bright sash. Pink boots and a white collar necklace complete the to-die-for outfit. Look for monsterrific touches, like her pink-streaked hair, fangs and heart marking that showcase her freaky fabulous flaws. Ghouls at home will love learning to embrace what makes them unique along with their beast friends from Monster High. Collect them all (each sold separately, subject to availability). Includes articulated Draculaura doll wearing fashion and accessories. Doll cannot stand alone. Colors and decorations may vary. The Monster High original ghouls wear their freaky flaws with pride! Their sleek fashions are perfect for a day inside the iconic walls of Monster High -- or an adventure in the monster universe outside. Articulation at the shoulders and knees adds to the fun with more scary cool poses and storytelling possibilities. Each doll’s fashion is inspired by her fierce personal style and unique scaritage. Clawdeen Wolf doll, daughter of the Werewolf, looks clawesome in her signature purple with a graphic print and one-shoulder silhouette. Neon boots and a matching studded belt complete the to-die-for outfit. Look for monsterrific touches, like her purple-streaked hair, fangs and wolf ears that showcase her freaky fabulous flaws. Ghouls at home will love learning to embrace what makes them unique along with their beast friends from Monster High. Collect them all (each sold separately, subject to availability). Includes articulated Clawdeen Wolf doll wearing fashion and accessories. Doll cannot stand alone. Colors and decorations may vary. The Monster High original ghouls wear their freaky flaws with pride! Their sleek fashions are perfect for a day inside the iconic walls of Monster High -- or an adventure in the monster universe outside. Articulation at the shoulders and knees adds to the fun with more scary cool poses and storytelling possibilities. Each doll’s fashion is inspired by her fierce personal style and unique scaritage. Cleo de Nile doll, daughter of the Mummy, comes alive in shades of teal and gold with a Skullette and mummy-inspired print dress with black neck. Golden shoes, a purple bangle and cool earrings complete the to-die-for outfit. Look for monsterrific touches, like her dark hair with bangs and wrap markings, that showcase her freaky fabulous flaws. Ghouls at home will love learning to embrace what makes them unique along with their beast friends from Monster High. Collect them all (each sold separately, subject to availability). Includes articulated Cleo de Nile doll wearing fashion and accessories. Doll cannot stand alone. Colors and decorations may vary. Monster High Scary Tales Pictures of dolls and books pages!! Thanks for watching guys! 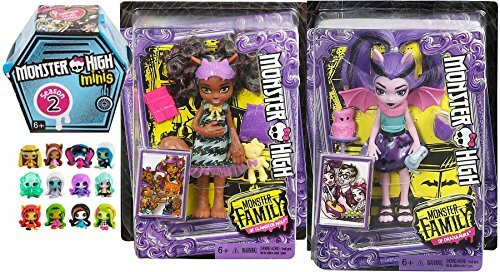 MY LINKS: TWITTER: https://twitter.com/IWilliamII SUBSCRIBE TO THE OFFIAL MONSTER HIGH YOUTUBE CHANNEL: https://www.youtube.com/user/MonsterHigh/featured I don't own any of the pictures. 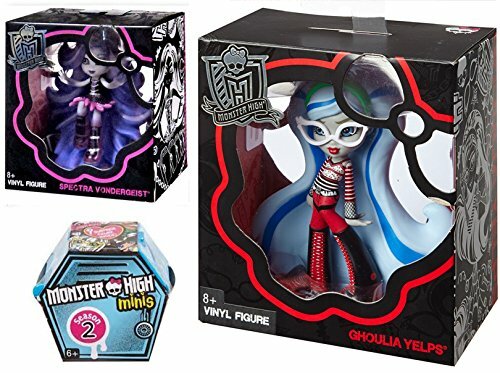 Compare prices on Scary Tale Monster High Dolls at ShoppinGent.com – use promo codes and coupons for best offers and deals. Start smart buying with ShoppinGent.com right now and choose your golden price on every purchase.